Tourism is a growing industry in India, with people from all over the world coming here to experience the country’s natural beauty and visit its vast array of states and their differing cultures and climates. 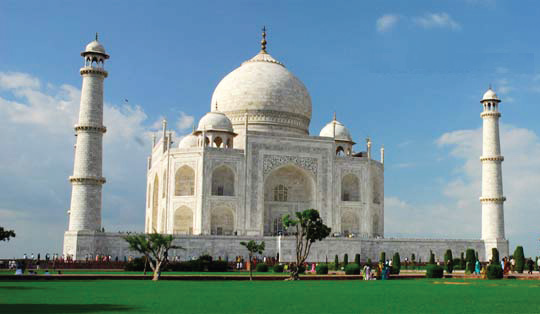 Many are also attracted by India’s famous landmarks such as the Taj Mahal and Khajuraho Temples. The largest number of foreign tourist arrivals are usually seen in December and January during the cooler winter months when temperatures are more bearable. Tourism is the largest service industry in India with a substantial contribution to the country’s Gross Domestic Product (GDP) and employment. The visa on arrival began in 2014 and as of April 2015 applies to tourists from over 40 countries, with a plan to expand this to around 100 nationalities over the next few years. It is not only the number of inbound tourists that is growing in India; Indian nationals are travelling more too. Departures of nationals grew from just 4.42 million in 2000 to more than 18 million in 2014. However, far fewer Indian nationals travel internationally than domestically – domestic tourist visits exceeded one billion for the first time in 2012. Tourist Arrivals in India increased to 7,36,000 in July from 5,50,000 in June 2016. Tourist Arrivals in India averaged 4,20,608.60 from 2000 until 2016, reaching an all time high of 9,13,000 in December of 2015. Tourist Arrivals in India is reported by the Department of Tourism, India. The travel and tourism industry contributed a total of US $113.2 billion to GDP in India in 2013 – this accounted for 5.35 percent of India’s total GDP. At present it is estimated to contribute 6.23 percent to the GDP and about 9 percent to the total employment. The industry directly provided more than 22 million jobs. Not only India is the second largest tourism market in Asia after China, the country was also ranked in the twenty fastest-growing tourism destinations worldwide by the World Travel and Tourism Council. Placed eleventh in the list, the direct contribution of travel and tourism to GDP in India is expected to grow an average of 6.4 percent annually between 2014 and 2024. In 2013, there were 6.85 million international tourist arrivals in India. This was a large increase from the 2.65 million seen just 13 years ago in 2000. The largest source market for visitors to India was the United States, followed by the United Kingdom. In 2013, visitors in India spent 18.4 billion U.S. dollars. Outbound travel from India is also on the rise: approximately 8,60,000 Indian nationals travelled to the U.S. in 2013. This figure was forecasted to rise to 1.32 million in 2018. Europe is even more popular, with 1.77 million Indian tourists travelling there in 2014. At international level too tourism continues to grow above average in the first four months of 2016. Started on a strong note. This year international tourist arrivals grew by 5 percent between January and April 2016 according to the latest UNWTO World Tourism Barometer. Results were robust across almost all sub regions and many destinations reported double-digit growth. Prospects for May-August remain positive, with around 500 million tourists expected to travel abroad in the Northern Hemisphere summer holiday peak season. Exports from international tourism rose by 4 percent in 2015.International tourism receipts in destinations around the world grew by 3.6 percent in 2015, in line with the 4.4 percent increase in international arrivals. For the fourth consecutive year, international tourism grew faster than world merchandise trade, raising tourism’s share in world’s exports to 7 percent in 2015. The total export value from international tourism amounted to US$ 1.4 trillion. International tourist arrivals grew by 4 percent and reach a record 1.2 billion in 2015 International tourist arrivals increased by 4.4 percent in 2015 to reach a total of 1,184 million in 2015, according to the latest UNWTO World Tourism Barometer. Some 50 million more tourists (overnight visitors) travelled to international destinations around the world last year as compared to 2014. Visa Openness levels continue to progress The World Tourism Organization (UNWTO) has been long advocating for the need to advance travel facilitation as a means to promote tourism development and multiply its socio-economic benefits. According to UNWTO's latest Visa Openness Report, the share of tourists required to obtain a visa prior to travelling continues to decline and is at its lowest level ever. There’s a rising trend of tourists wanting to unplug and completely sign-off from work on holiday, and the shift from the “always on” traveller has begun. 72 percent of UK travellers switched off (or as much as possible) in 2013 - this is only increasing further, and will even more so in time to come. Traditionally, the construction of hotels has been financed by banks and investments, but the luxury hotel segment has been increasingly turning away from these sources of financing toward a new option: crowd-sourcing. With a potentially long lead time on funding, individual luxury hotels with unique features are finding that appealing directly to the people interested in what they have to offer enables them to secure financing that might be denied by more traditional routes. Through crowd funding, individuals interested in different hotel concepts can directly invest in the development of these new properties. In return the hotel will offer space for both short- and long-term stays. Travelling alone is not new. What’s new is that more and more people are interested in traveling alone—and that the people most interested in going solo are millennials. MMGY Global Survey of American adults found that 37 percent of millennial respondents planned to travel by themselves in July 2015, an increase of 5 percent from 2014. The leading reason for solo travel is that it’s quite simply easier to plan a trip for 1 than for 2 or more. Today’s travellers are growing increasingly tired of the largely commercialized and over-frequented centers in Europe’s major cities. Now holiday is often about getting off the beaten path, doing something different and discovering authenticity—something many tourists feel is missing during trips to London, Paris and Rome. Along with partaking in various wellness initiatives, travellers will also be seeking to leave the comfort of their resort or hotel and truly integrate themselves in the culture of their chosen country. This year will see travellers actively chasing an authentic experience of a location, opting to explore less tourist-focussed locations and avoid anything considered cliché or forged. This could also lead to fewer holiday selfies being taken, as travellers seek to live in the moment more. The combination of business and leisure travel (or bleisure) will become more common. Travelling for business reasons is already common across a number of industries, but in 2016 professionals will be looking to combine a bit of leisure time into their trips, potentially bringing family and friends along, too. Otherwise referred to as volunteer travel or volunteer vacations, voluntourism is travel that has volunteering for a good or charitable cause as its main purpose. Especially in light of the natural disasters that have been going on around the world, travelers are taking vacations not only to relax and have fun but also to give back and be of service to the communities they are visiting. Some examples of voluntourism activities range from building projects, cleaning up local wildlife areas, planting gardens, teaching English, or caring for orphans. BRIC travelers are travelers that are from Brazil, Russia, India and China. The reason why these countries are singled out to create a specified acronym is because they are the fastest growing emerging markets in travel, tourism and hospitality and are expected to drive economic growth for the industry worldwide. With China and India ranking first and second among the four countries for being most important in both inbound and outbound travel, organizations in the industry globally are adapting their business plans to take advantage of this massive trend. Otherwise known as food tourism, culinary tourism is travelling to countries and getting to know the respective cultures through food and food related experiences and events such as festivals and food competitions. This is one of the most creative trends in the industry and today’s travellers are looking for hands on experiences where they can visit local farms, wineries and cheese makers, interact with chefs or cookbook authors and go on food tours or tastings that highlight local or ethnic specialties and restaurants. Space tourism is space travel for recreational, leisure or business purposes. A number of start-up companies have sprung up in recent years, hoping to create a sub-orbital space tourism industry. Orbital space tourism opportunities have been limited and expensive, with only the Russian Space Agency providing transport to date. But many other players have approached this genre and are exploring it. Tourism creates jobs, both through direct employment within the tourism industry and indirectly in sectors such as retail and transportation. When these people spend their wages on goods and services, it leads to what is known as the "multiplier effect," creating more jobs. The tourism industry also provides opportunities for small-scale business enterprises, which is especially important in rural communities, and generates extra tax revenues, such as airport and hotel taxes, which can be used for schools, housing and hospitals. Successful tourism relies on establishing a basic infrastructure, such as roads and hotels. The cost of this usually falls on the government, so it has to come out of tax revenues. Jobs created by tourism are often seasonal and poorly paid, yet tourism can push up local property prices and the cost of goods and services. Money generated by tourism does not always benefit the local community, as some of it leaks out to huge international companies, such as hotel chains. Destinations dependent on tourism can be adversely affected by events such as terrorism, natural disasters and economic recession. Yet the improvements to infrastructure and new leisure amenities that result from tourism also benefit the local community. Tourism encourages the preservation of traditional customs, handicrafts and festivals that might otherwise have been allowed to wane, and it creates civic pride. Interchanges between hosts and guests create a better cultural understanding and can also help raise global awareness on issues such as poverty and human rights abuses. Tourism -- particularly nature and ecotourism -- helps promote conservation of wildlife and natural resources such as rain forests, as these are now regarded as tourism assets. It also helps generate funding for maintaining animal reserves and marine parks through charges and fees. By creating alternative sources of employment, tourism reduces problems such as over-fishing and deforestation in developing nations. The government wants to focus on encouraging tourism industry to deliver an unforgettable travel experience to the visitors through high standards of services. Few travel destinations in the world can match the diversity and wonder of our tourist places. The unique combination of landscape, culture, and other attractions are unmatchable for a tourist visiting India. There is a new paradigm of growth and development in creating employment and entrepreneurship. The Tourism Sector presents a number of investment opportunities in areas of infrastructure development. With the improvement of infrastructure in the core and tourism related sectors through investments and partnerships between the public and private sectors, India has the potential to become one of the most sought after destinations in the world.